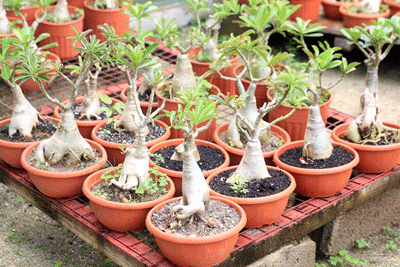 A resident of Seychelles has turned his passion and hobby of growing miniature trees in containers — a Japanese art called bonsai — into a business. “From the time I started to now I have not stopped making new bonsais, especially now that a lot of people live in flats with small compounds. So by creating smaller fruit trees, smaller flowering plants that look good in a pot, it’s easier for those who have limited or no garden space,” says Loiseau. 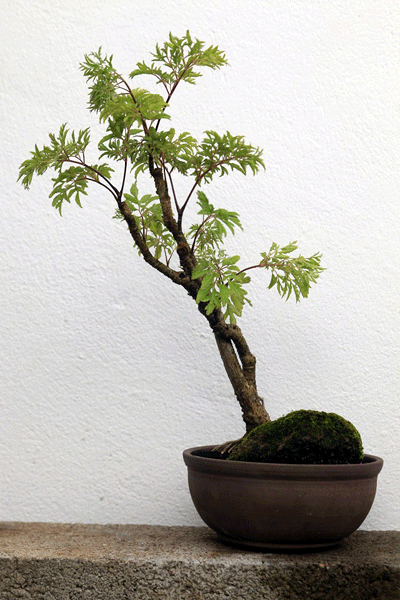 Bonsai is Japanese for ‘planted in a container’ and is an ancient art requiring expertise in pruning and wiring each plant as well as adeptness to produce a variety of plant sizes and shapes. It started in China, was adopted by Japan and has moved to other parts of the world including Seychelles, an archipelago in the western Indian Ocean. 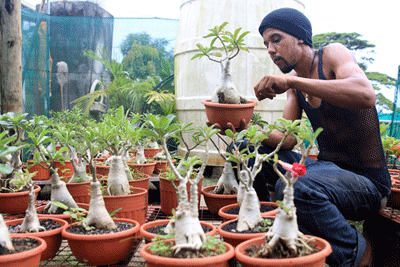 The Seychellois bonsai artist is not only selling but renting his plants to various organisations and hotels, and he says his main business is artistic decor. However, he keeps some bonsais for his personal collection. “We do indoor gardens, wall gardens, fountains and other water features, for example at State House and also at the Pension Fund Office where we are creating a small jungle like environment for a recreational area,” added the artist. With his love for his miniature plants, Loiseau is careful about the up-keeping of his plants and therefore only sells certain types of bonsais that are easier to grow and maintain. Before selling, he ensures that the plants are going to be in good care. Loiseau’s interest in bonsai began at age 16 while observing one of his mother’s tenants, Livio Lang, creating miniature plants. He was fascinated by Lang’s flamboyant tree which looked exactly like a full grown one. Since he loved plants and already had the basic knowledge of the art, after his studies at the Chelsea Art College in London, Loiseau ventured into growing miniature plants. Loiseau had no practical training, so his experience came through playing around with various plants at the same time doing research online. 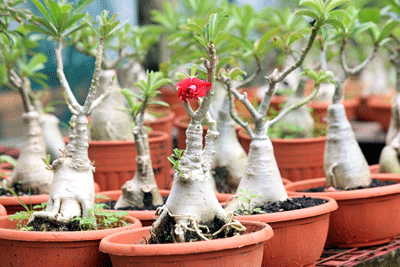 The painstaking art of bonsai as a business in a tropical climate comes with its challenges mainly related to periods of excessive rain that destroys the micro-nutrients in the soil or too much sunlight, and insects. To address this concern, Loiseau is in the process of building a dome to provide a controlled environment for the plants. Reflecting on the future, Loiseau is to set up an association if he gets a group interested in that form of art while working on other projects. “I intend to build a garden centre to house plants like bonsai for display and, for a fee, and to teach this art. We are doing it now free for the state schools,” says Loiseau. Aside from bonsais and other plants, Loiseau’s business ‘Early Bloom’ cultivates medicinal plants like lemon basilica and black oak basilica which are also for sale.